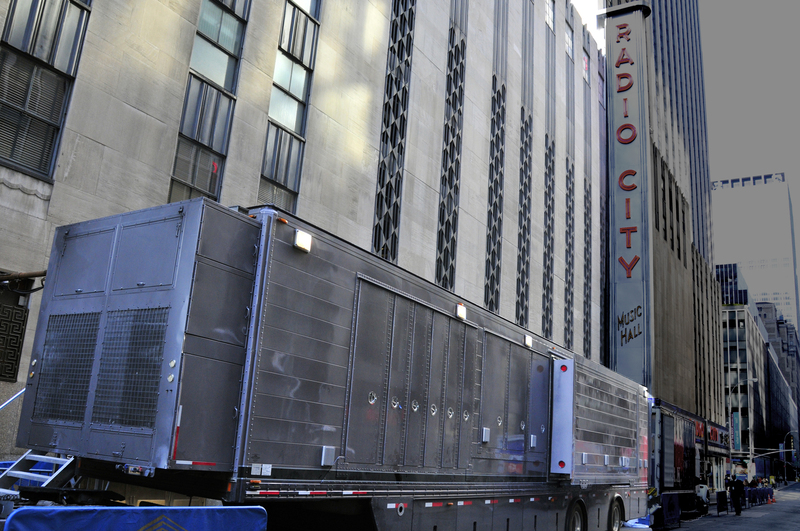 One of All Mobile Video’s mobile production trucks, parked outside Radio City Music Hall in New York City. Los Angeles, CA, November 10, 2015 – As the remote-production community hits the road to bring sports, awards shows, concerts and other live events into our living rooms, they are dealing with evolution in professional audio workflows. And two names have become synonymous at the forefront of this seismic shift in pro audio methodology: Audinate’s Dante™ networking system and Focusrite’s RedNet series of Dante network interfaces. NEP provides the technology and know-how to enable their clients to produce the worlds’ biggest live and broadcast events around the globe. The company is the leading worldwide provider of outsourced production solutions offering technical services for remote production, studio production, video display, host broadcasting and post production. For its newest remote-production truck, SSCBS, which will be used by primarily for major PGA and NFL events, two RedNet D64R units provide up to 64 completely bi-directional channels of both coaxial and optical MADI interfaces with other Dante-enabled devices and systems (in this case between the Dante network and the truck’s Evertz routers), as well as a bridge to the intercom system. The SSCBS truck, which hit the road on August 18, represents a substantial change in technology culture, says Michael Naugle, Design Engineer with NEP. “This is our first use of Dante in any of our trucks,” he says. “We've used CobraNet for years, so we’re familiar with the concept of audio-over-IP, but Dante is our first delve into this generation of audio networking, and RedNet is our interface of choice for that.” Naugle acknowledges that it takes a lot to get the traditionally conservative broadcast culture to embrace new platforms, and with good reason: understandably, it tends to stick with what it knows works. So when the decision was made to integrate Dante networking, a lot would depend on the reliability of the interfaces. RedNet, says Naugle, offers just that. Furthermore, it will provide a way to introduce digital networking into existing remote-production trucks, offering a bridge between legacy MADI-connected systems and the network. “It’s a way forward not just for new trucks but for the entire fleet,” he says. As one of the country’s premier providers of end-to-end video and audio solutions, All Mobile Video (AMV) offers a full spectrum of production services, including a fleet of mobile production units that have been the path to television for major events including the Macy’s Day Parade, the GRAMMY® Awards, MTV Movie Awards and many others. 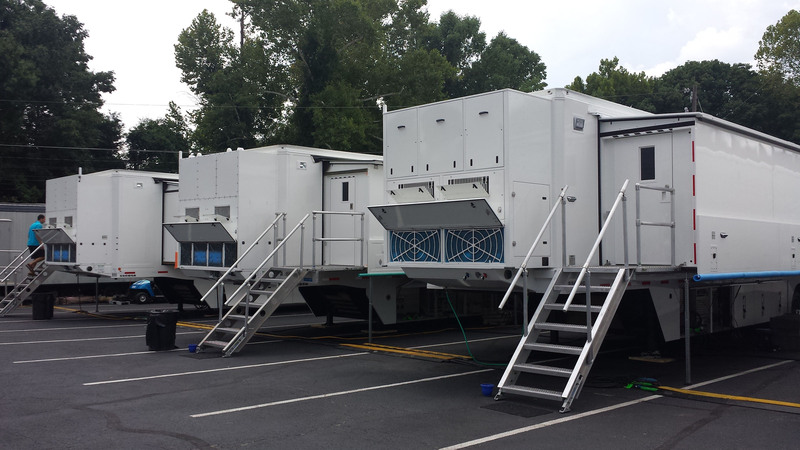 AMV’s newest remote-production truck, nearing completion, will utilize two RedNet 1 eight-channel analog I/O units and seven RedNet 2 16-channel I/O units. The RedNet analog AD/DA converters will be used with the truck’s RTS ADAM® Frame intercom system, as the media transport technology for the ADAM Frame’s OMNEO® media networking architecture. “The RedNet 1 and 2 units will distribute Dante throughout the vehicle, to video and audio,” explains Ian Vysick, Audio Development Specialist for AMV. “MADI will only be used for the console; everything else is Dante through RedNet.” Vysick says that his experience with other Focusrite products made the shift to Dante-based networking an easier decision. But RedNet’s operational design also contributed to that. “Dante as a platform is so new that there’s a limited amount of test equipment out there,” he says. “The metering built into the front panel of the RedNet devices is important because I get a visual confirmation that the signal is hitting the converter when I talk. It provides an important level of confidence in that way.” And finally, he adds, RedNet just plain sounds good. “A lot of what we do is music, so the sonic quality has to be there, even for intercoms,” he says. Photo caption 2: One of All Mobile Video’s mobile production trucks, parked outside Radio City Music Hall in New York City.